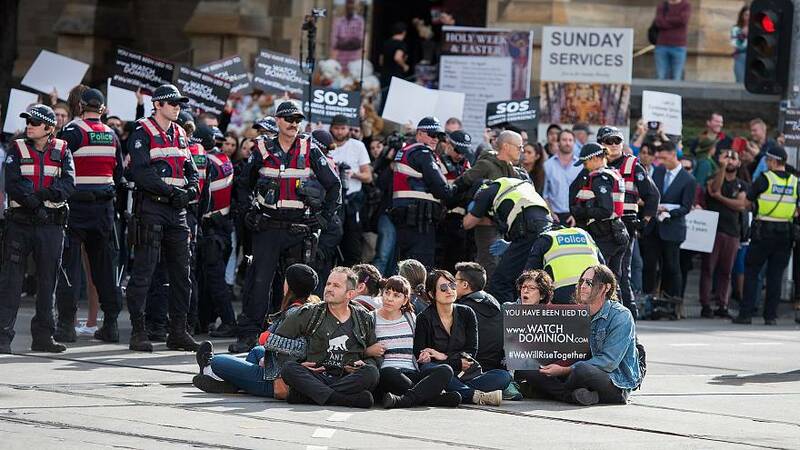 Australian police arrested 38 animal rights activists on Monday (April 8) after they blocked peak hour traffic in Melbourne in protests to mark the first anniversary of a film, Dominion, about factory farming. The protests were part of a wave of action in three states, where activists targeted abattoirs in the middle of the night to protest cruelty to animals. The documentary Dominion, directed by Chris Delforce, used drones and undercover footage to film feedlots and saleyards to show how animals are treated in the production of meat, dairy, eggs and leather. Protesters blocked a major Melbourne intersection for two hours, stopping trams bringing thousands of commuters into the city. Further down the road, activists blocked the entrance to Melbourne's aquarium. Police said they had not been told in advance about the protests.